Our watch dial refinishing services include restoration, refinishing, customization and/or personalization on just about any watch dial. If your dial is discolored, faded, or old making it illegible or ugly to look at. Or perhaps has been a victim of water, moisture damage or a novices watchmaker scratch that damage the dial. 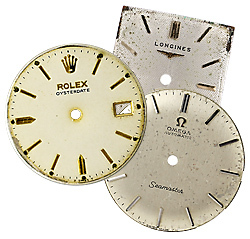 We can refinish your dial back to its original look.